Former Prime Minister Atal Bihari Vajpayee's mortal remains have kept at the BJP headquarters on Deen Dayal Upadhyay Marg where thousands of people have queued up to pay homage to the departed soul. Former Prime Minister Atal Bihari Vajpayee’s mortal remains have been kept at the BJP head office where thousands of people have queued up to pay homage to the departed soul. Vajpayee, who passed away last evening at 93, had served as the Prime Minister of India thrice – 1996, 1998-99 and 1999-2004. He was admitted to AIIMS on June 11 following deterioration in his health due to age-related issues. He was put of life support three days ago as doctors failed to revive him. He breathed his last at 5:05 pm yesterday. 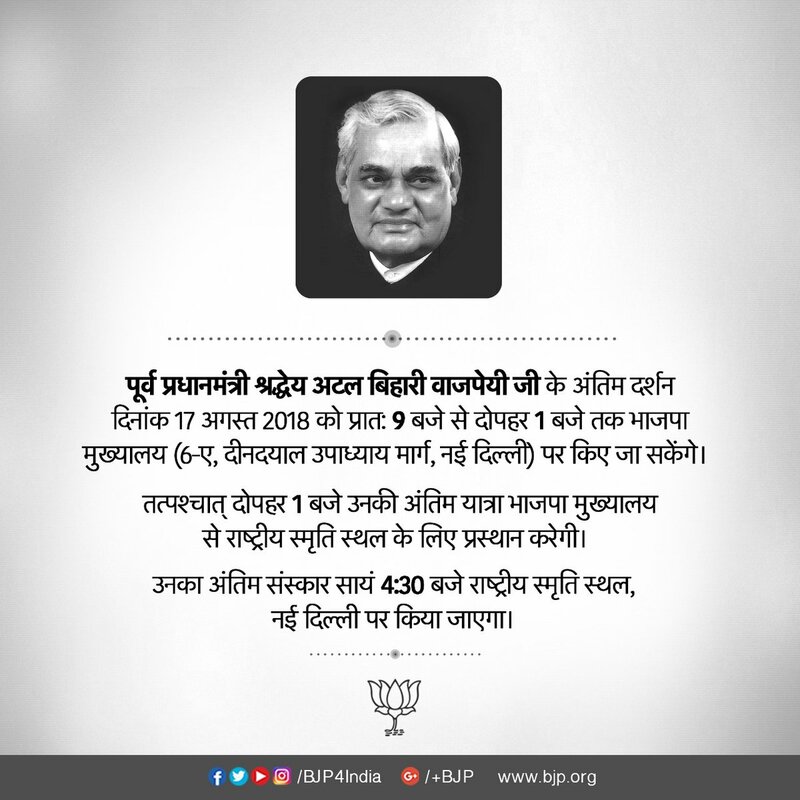 His final journey is scheduled to begin at 1 pm from BJP headquarters on Deen Dayal Upadhyay Marg and reach Rashtriya Smriti Sthan near Vijay Ghat at around 4 pm. He will be cremated at 4:30 pm. Sri Lankan President Maithripala Sirisena and Prime Minister have condoled the death of Atal Bihari Vajpayee. The leaders said that Vajpayee had played a vital role in ensuring stability of the island nation. Sirisena said: "Today, we have lost a great humanist and a true friend of Sri Lanka. Former Prime Minister of India Atal Bihari Vajpayee was a visionary leader and an ardent defender of democracy. My condolences to his family and millions of his admirers around the world." CPI(M) general secretary Sitaram Yechury said that Atal Bihari Vajpayee was a great leader and he never harmed anyone despite having ideological differences. “It was the specialty of Atal ji that he never let humanity be harmed due to the political and ideological differences. Such principle is needed in the country today,” he said. Bangladesh Foreign Minister Abul Hassan Mahmood Ali said that Atal Bihari Vajpayee will be remembered by people of Dhaka for his immense contribution to the Liberation War. "We remember him for his contribution to Bangladesh Liberation War and strong support to people of Bangladesh. He had great liking for Bengali music. I had the privilege of serving in Delhi as career diplomat when he became Foreign Minister," he told ANI. Ali arrived in Delhi early this morning. He will be attending the funeral of Vajpayee later today. Delhi Chief Minister Arvind Kejriwal and his deputy Manish Sisodia visited the BJP heaquarters to pay homage to former Prime Minister Atal Bihari Vajpayee. party MP Sanjay Singh was also with them. 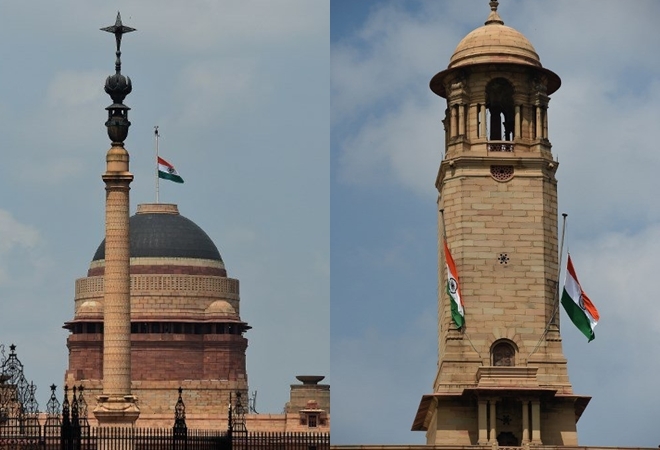 Tricolour is flying at half mast on the Rashtrapati Bhavan and Home Ministry as nation mourns former Prime Minister Atal Bihari Vajpayee's demise. Bangladesh Foreign Minister Abul Hassan Mahmood Ali has arrived in Delhi. The Minister will be attending the funeral of former Prime Minister Atal Bihari Vajpayee later today. Minister for Foreign Affairs of Nepal Pradeep Kumar Gyawali arrives in Delhi. He will be attending the funeral of former Prime Minister Atal Bihari Vajpayee. 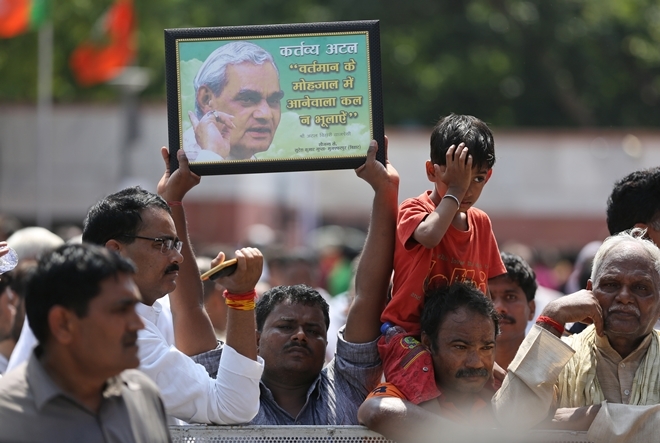 Thousands of people have queued up at BJP head office to catch a glimpse of deceased party leader and former PM Atal Bihari Vajpayee. Senior BJP leader LK Advani today paid homage to Atal Bihari Vajpayee at BJP headquarters on Deen Dayal Upadhyay Marg. Bollywood actor Shah Rukh Khan has paid an emotional tribute to former Prime Minister Atal Bihari Vajpayee. In a tweet, Khan remembered how his father used to take him for every speech Vajpayee made in Delhi. A delegation of Pakistan government headed by Law Minister has been granted visa to travel to Delhi. The delegation will arrive in Delhi shortly to pay homage to former Prime Minister Atal Bihari Vajpayee, a tv report said. King of Bhutan Jigme Khesar Namgyel Wangchuk has reached Delhi. He will be attending the last rites of former prime minister Atal Bihari Vajpayee. Prime Minister Narendra Modi today paid homage to Atal Bihari Vajpayee at the BJP headquarters. 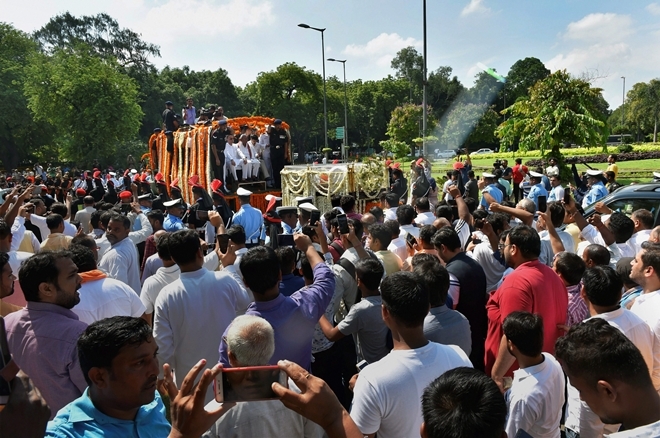 The funeral procession of former Prime Minister Atal Bihar Vajpayee has reached the BJP head office on Deen Dayal Upadhyay Marg. PM Narendra Modi, BJP president Amit Shahy, Union Ministers, CMs of BJP-ruled states and several other leaders are present at the BJP office. According to tv reports, around 1 lakh people are expected to throng the Smriti Sthal to attend the last rites of Atal Bihari Vajpayee who passed away on Thursday evening after prolonged illness. PM Narendra Modi, BJP president, CMs of several states and top opposition leaders will be present at the Vijay Ghat when Vajpayee's mortal remains will be consigned to the flames at 4:30 pm. The mortal remains of Atal Bihari Vajpayee will reach the BJP head office in a few minutes from now. His body will be kept here to allow general public to pay homage to the departed soul. From here, Vajpayee's funeral process will be taken to Vijay Ghat. He will be cremated at 4:30 pm. Congress President Rahul Gandhi was slated to meet all Pradesh Congress Committees, Congress Legislature Party leaders, General Secretaries and In charge of all states at 3.30 pm today over Rafale issue. But, he has postponed the meeting till tomorrow. Courts in Delhi to function till 1 pm today in view of Atal Bihari Vajpayee's funeral. ANI reported that Delhi High court and all District courts will be open till 1 pm. The competent authority has decided that there will be half-day holiday today to allow officials and staff to attend the funeral of former PM Atal Bihari Vajpayee at Smriti Sthal. Delhi Police said that elaborate security arrangements have made for the last rites of former Prime minister Atal Bihari Vajpayee. “It will be ensured that the people who come to pay last respect and the commuters face minimum inconvenience and that there is no compromise with security,” Delhi DCP Madhur Verma said. Hundreds of people have gathered outside the BJP headquarters on Deen Dayal Upadhyay Marg to catch a last glimpse of Atal Bihari Vajpayee when his mortal remains reach here in few minutes from now. Vajpayee's mortal remains will be kept here for general public to pay last respect to the departed soul. Prime Minister Narendra Modi and BJP president Amit Shah have reached the BJP headquarters on Deen Dayal Upadhyay Marg. Shah and Modi will received the mortal remains of Vajpayee here. His mortal remains will be kept here till 1 pm. From here, Vajpayee's body will be taken to the Vijay Ghar for last rites. Scores of BJP leaders and CMs are expected to join Modi and Shah at the BJP office. 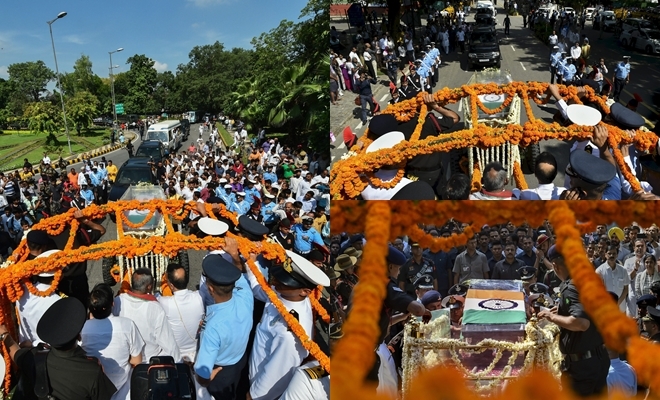 The mortal remains of former Prime Minister Atal Bihari Vajpayee are now being taken the BJP headquarters on Deen Dayal Upadhyay Marg from his 6A Krishna Menon Marg. Vajpayee's mortail remains will be kept here to allow public to pay homage to him. His funeral procession will leave for Vijay Ghat at 1 pm.